← Parfait! Big Cheeseburger ‘Za! Romaine, cherry tomatoes, ciabatta bread and asparagus, all lightly grilled and then combined into one, fine salad with a bit of bacon, basil, and a very nice onion, red wine vinegar and honey vinaigrette. This is another recipe from nice folk at Better Homes and Gardens summer 2013 grilling magazine. 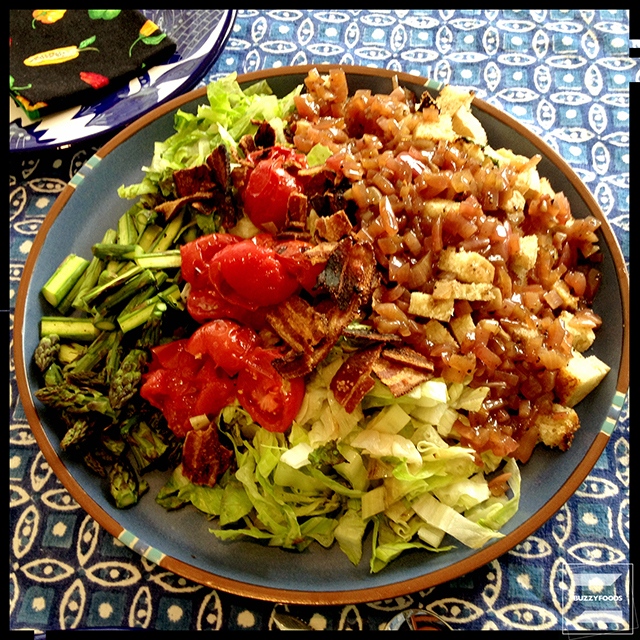 I did, of course, make a few, wee, tiny changes – adding asparagus because – why not? 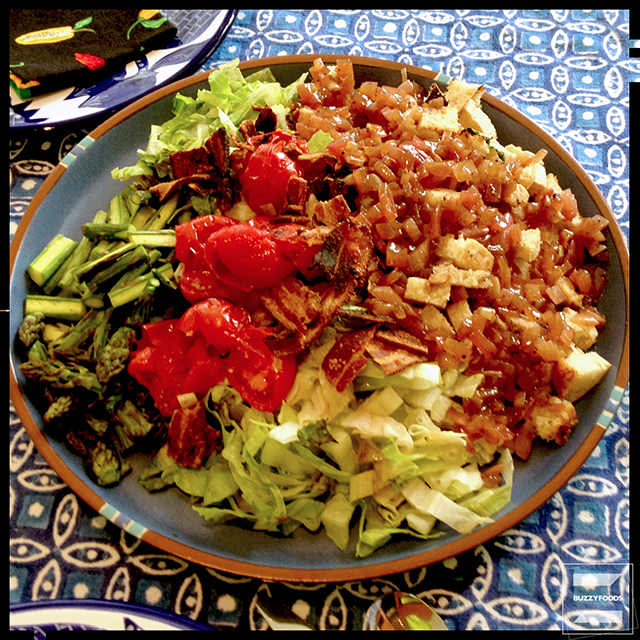 – and doubling the vinaigrette. I also left off the cheese. Early in the day: cook the bacon in a large skillet (I used my ever-handy ceramic tagine) until nicely crispity – I seasoned mine with a bit of good Tellicherry pepper, some Gateway to the North Maple Garlic Seasoning, and a dash or three of Earl’s. 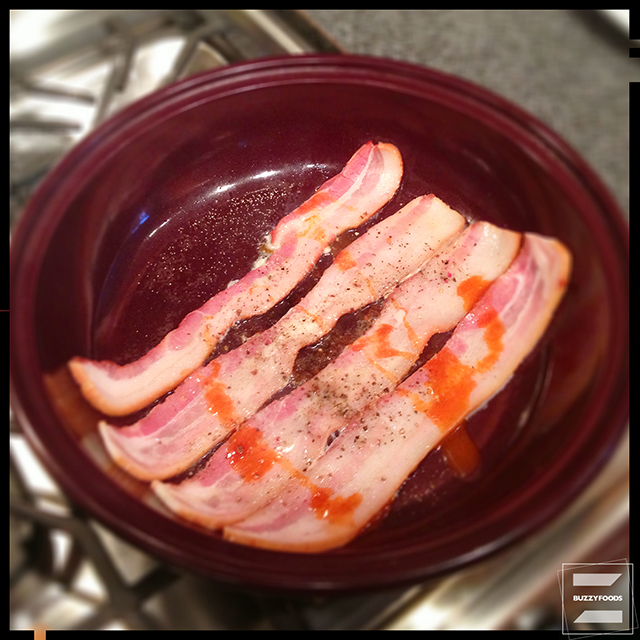 Remove the bacon to a paper towel-lined plate to drain. 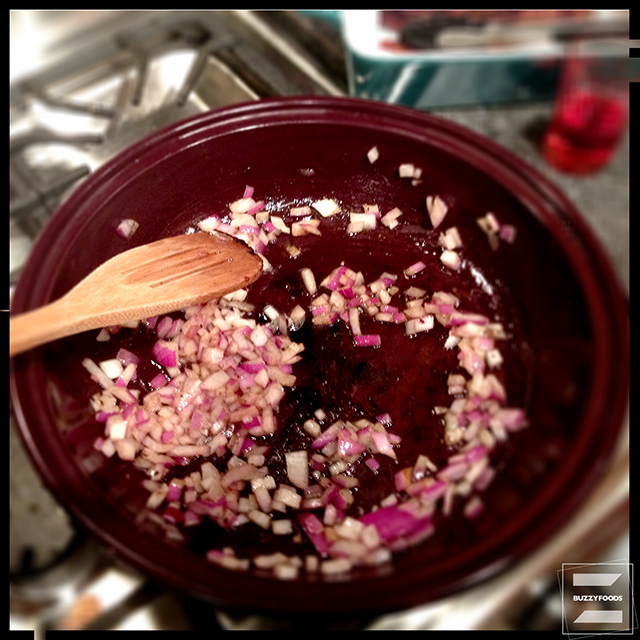 Measure the bacon drippings in the pan and add enough olive oil to make about 1/4 cup. Return the drippings and oil to the pan and warm over medium-high heat. Add the onion and cook, stirring every non and then, until tender, five to ten minutes. Stir in the vinegar, honey, salt and pepper and cook for one more minute, scraping up any crispity bits stuck to the bottom of the pan. Transfer to a covered jar and stash in the fridge until needed – tho’ you will want to bring the dressing to room temperature before using – mebbe 45 minutes on the counter top. Later, but still early that same day: well, in truth, the nice folk at BH&G never said to do all is ahead of time, but we were having folk for dinner, and were gonna be grilling those steaks, so I didn’t want to fuss with Rich grilling the salad and me frying bacon when he could’ve been working on the steaks and I could be swilling some wine with friends, so we did all of this in the morning – the grilled potato salad, too! Anyway, brush the cut sides of the lettuce and the ciabatta with some olive oil and thread the tomatoes on a skewer – leaving a bit of space between each tomato. 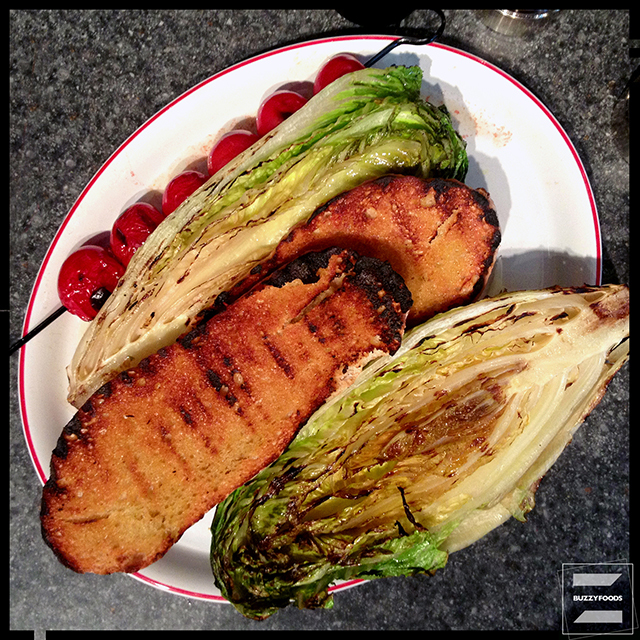 Grill directly on the grates for two to four minutes, until they are nicely marked, then remove to a platter. Toss the asparagus with some olive oil, sea salt, and fresh black pepper and cook in a grill pan for eight to ten minutes, until still bright green but slightly blackened on the edges, then remove to a platter. 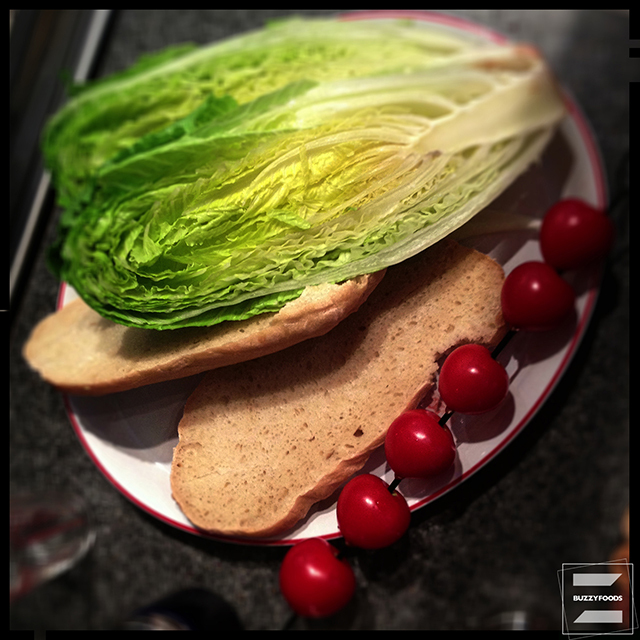 To make the salad: coarsely chop the lettuce and tomatoes, slice the asparagus into two inch or so pieces, and cut the ciabatta into one inch chunks. Add the torn basil and (if you want to use it) the cheddar cheese, then drizzle with the vinaigrette and give it all a good toss. Let rest for fifteen minutes before serving. Nice. But next time, I plan on rubbing that ciabatta with a goodly bit of garlic before grilling. This entry was posted in Salad and tagged Asparagus, Bacon, Ciabatta Bread, Grilled Asparagus, Grilled Romaine, Grilled Tomato, Panzanella, romaine, salad. Bookmark the permalink.